Christmas trees hold so many memories for me. I used to stare for hours at the huge Christmas tree that resided gloriously in the front of the small hometown country church when I was a kid. The decorations on it were antique probably, brought over by early German, Swedish and Norwegian immigrants. Fluffy cottony angels. Rolled up parchment music scrolls. Fragile glass ornaments. Whimsical fan ornaments that you could blow air into the bottoms of to make them spin. Our home tree had some similar ornaments, like the blowing fans, but it also had many rustic home made ornaments. The usual clothespin reindeer from grade school years. Occasional popcorn and cranberry strands. Hand strewn tinsel. But my two favorites were the gingerbread men and an elf. The chubby gingerbread men, we baked and decorated, then hung on the tree from string. My brother, sister and I loved to lie on the ground beneath the tree. Staring up at the blinking lighted branches, blowing the swirling fan ornaments, we would then lean up and munch the lower-hanging gingerbread people. Soon there would be only some tiny gingerbread heads, hanging forlornly from the bottom parts of the tree. This little green elf is my other favorite. An old salvaged piece from my childhood tree. I'm not sure how I got so lucky to keep him. Now each year that my own family and I set up our tree, the elf has a place of honor. First he is unwrapped carefully from the rest of the ornaments coming out of the purple plastic Christmas bin. The kids ooh and ahh with me. "It's the elf!" they exclaim, knowing that it is special to me. This year, the kids decided that it was my turn to place him in the tree. Standing up, surveying the tree, we looked for the perfect spot. He couldn't usurp the Nativity ornaments --since Jesus is the main point of Christmas, definitely! Suddenly, there was the right spot. 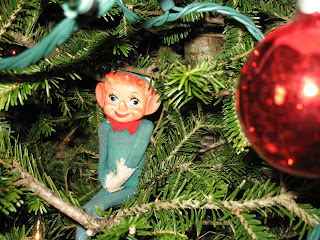 Hidden inside a hole in the branches, nestled up against the trunk the green cloth elf took his seat. His legs are worn and barely stay attached by tattered green threads. Ahhh.... We turned off the house lights, sat under the Christmas tree, and savored the beauty and peacefulness. Jesus came to earth, and we celebrate his coming each year. This is but one small part of it.